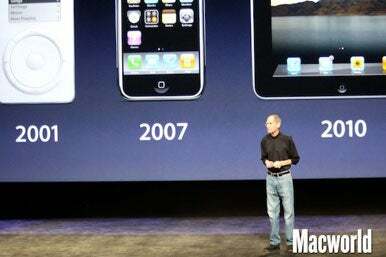 Apple CEO Steve Jobs—on medical leave from the company—made an appearance at Wednesday’s Apple press event in San Francisco to introduce the iPad 2. “We’ve been working on this product a while, and I didn’t want to miss today,” Jobs told reporters. Walking on stage at the start of the event, Jobs received a standing ovation from those in attendance. Jobs has battled various health issues over the past few years, including a rare, treatable form of pancreatic cancer in 2004 and what he referred to as a “hormone imbalance” that led to a 2009 liver transplant.